We know a successful campaign looks like new, happy customers who come back again and again. We also know that a smooth redemption process makes for happy customers...and a happy staff! Localvore is on deck to help train your team on redemption so everyone feels confident and prepared to deliver high quality service when your Impact Offer goes live. When your new customers come in, they'll pull up their purchases on their phone at localvore.co. The fine print for the voucher will be clearly presented on this screen. Get prepared in advance for customers to come in with their vouchers by going to merchants.localvore.co and logging into your account on the device you've designated for redemption. Once you're logged in, the site will remember you and your staff can easily navigate to your dashboard whenever they need to redeem a voucher. When your deal goes live for users to purchase, you'll see 'Redeem Deals' appear in the top right corner of your merchant dashboard. When the redemption screen is open, you'll see a field where you can begin by entering your customer's voucher code. Follow the steps below to complete the redemption process. We'll use the information you provide about bill total to calculate your Impact Offer ROI and report on your average bill total so you can evaluate the success of your campaign with real data. Don't forget! Your customers may still come in with Localvore vouchers after the promotion has expired. According to the laws of your state, all vouchers must be honored for their paid value after the promotional value expiration. Please keep this in mind and prepare your team! We make the current value of the voucher clear during redemption to eliminate confusion. Get in touch with our team at hello@localvore.co if you have unanswered questions, we're happy to help. Your Localvore Impact Offer is going live soon, your team is prepared to redeem vouchers, and you're ready to drive new customers to your business while raising money for your favorite nonprofit. Before you do a happy dance, make sure to review these quick tips from our marketing team so you can set your campaign up for success! The best way to spread the word about your campaign far and wide is to create promotional posts for each of your social platforms. Tailoring your content to each social platform. What works for Instagram may not be so great for Twitter. It's important to maintain consistency while also being mindful of best practices. Tagging, tagging, tagging! Tag us (@localvore), the nonprofit you're featuring, and the farmers and producers you partner with for the food on that plate. The limit does not exist. Hashtagging for platforms that support them, like Instagram and Twitter. Does your business or any of the ones you're featuring use a branded hashtag? Include them, along with other relevant hashtags already being used by food lovers in your local community. Instagram allows for 30 hashtags but you may want to include them in a separate comment so they don't detract from your message. We're all about community-building and cross-promoting your Impact Offer is a great opportunity to forge and grow relationships. After you've tagged your partners in your social posts, reach out and ask them to share your campaign with their audience. Team work makes the dream work! Include your Impact Offer in your next email newsletter or consider dedicating a campaign to promote it. You can also reach out to food-related organizations in your community who send weekly or monthly newsletters. Step One: Select 'Create Deal' on your merchant dashboard menu. Step Two: Fill out the deal form! If you have questions about the recommended offer structure for your business, fine print, or unit cap, just drop our team a line. We want to help you make sure you see ROI on this campaign! After you finish creating your offer, you'll see it on your dashboard. If you've scheduled it for a future date, you'll see an alert on the post notifying you that it isn't live for purchase yet. 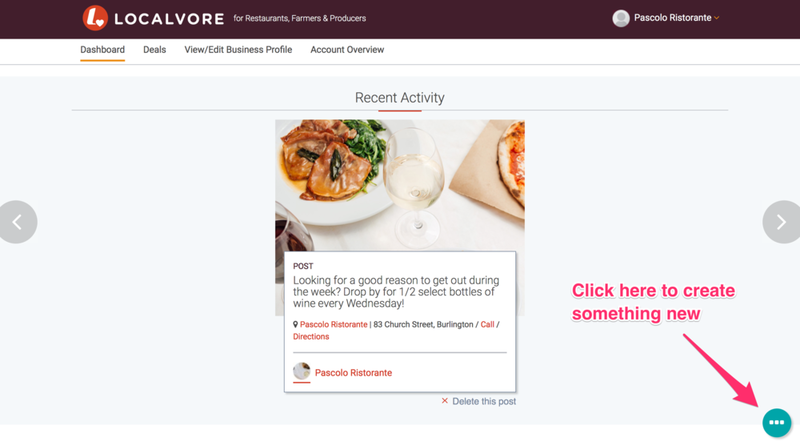 When your Impact Offer is live and available for purchase your followers will see it in their feed, Localvores will be able to discover it when they're browsing, and it will appear on your profile. Get in touch with our team at help@localvore.co if you have unanswered questions, we're happy to help. Next Step: Get ready for your new customers! Check out our redemption guide, a great resource to circulate to your team.